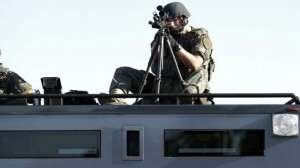 President Obama is banning local police departments from receiving a range of military-style equipment from the federal government — from grenade launchers to bayonets to certain armored vehicles — as he implements the recommendations of a panel that examined the controversial gear giveaways in the wake of the Ferguson riots. The White House announced Monday that Washington would no longer provide some military-style gear while putting stricter controls on other weapons and equipment distributed to law enforcement. The details were released in advance of an Obama visit to Camden, N.J., Monday afternoon where he met with youth and law enforcement. In addition to the new equipment-transfer bans, a longer list of equipment the federal government provides will come under tighter control, including wheeled armored vehicles like Humvees, manned aircraft, drones, specialized firearms, explosives, battering rams and riot batons, helmets and shields. Starting in October, police will have to get approval from their city council, mayor or some other local governing body to obtain it, provide a persuasive explanation of why it is needed and have more training and data collection on the use of the equipment.